A four-time All-Star, Yu signed a six-year contract with the Cubs in February of 2018 ... is 57-45 with a 3.49 ERA (338 ER/872.1 IP) and 1,070 strikeouts in 139-career major league starts with the Rangers (2012-17), Dodgers (2017) and Cubs ... Is the eighth Japanese-born player in Cubs history, and the fifth pitcher ... Ranked among A.L. Cy Young Award vote-getters in both 2012 (ninth) and 2013 (second) ... was named Rangers Pitcher of the Year in 2013 and 2014 ... Since 2012, ranks second among all pitchers in strikeouts per nine innings (11.10) ... ranks fourth in opponents batting average (.219) and fifth in hits allowed per nine innings (7.33) ... Set a major league record with 812 strikeouts in his first 100-career starts ... also became the fastest pitcher to 1,000 strikeouts by games pitched (128 games) ... Has made six-career postseason starts, including four starts in 2017 ... went 2-2 with a 3.52 ERA (9 ER/23.0 IP) in his first four postseason starts before allowing eight earned runs in 3.1 innings in two starts in the 2017 World Series ... Missed the entire 2015 season and the beginning of 2016 after undergoing Tommy John Surgery in March of 2015 ... surgery was performed by Dr. James Andrews ... Led the majors with 277 strikeouts in 2013, the second-highest single-season total ever by a Ranger, and his 2.83 ERA that year was sixth-lowest in team history ... Has retired at least the first 15 batters in a game five times in his career, twice taking a no-hitter into the eighth inning ... Had a seven-year career with the Hokkaido Nippon-Ham Fighters of the Japanese Pacific League in Nippon Professional Baseball (NPB) from 2005-11 … was a two-time Pacific League Most Valuable Player (2007, 2009) and one of 10 pitchers in the history of Japanese professional baseball to win multiple MVP awards in a career ... Pitched for Gold Medal-winning Japan teams in the 2009 World Baseball Classic and the 2007 Asian Baseball Championship, and also appeared for Japan in the 2008 Beijing Olympics ... Attended Tohoku High School in northern Sendai, a school which also produced major league pitchers Kazuhiro Sasaki and Takashi Saito. 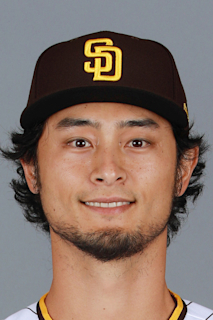 Yu made eight starts for Chicago before his season ended due to injury, as he landed on the 10-day D.L., May 26 (retroactive to May 23), with right triceps tendinitis ... went 1-3 with a 4.95 ERA (22 ER/40.0 IP) in his first season with the Cubs, walking 21 and striking out 49 ... Made his Cubs debut, March 31 at the Marlins, allowing five runs in 4.1 innings ... walked two and struck out four ... Pitched 5.0 scoreless innings after allowing one unearned run in the first inning of the Cubs' 3-2 win over the Brewers, April 27 ... also hit his second-career double in the fifth inning, his first hit with the Cubs ... Was on the 10-day D.L. from May 4-15 due to parainfluenza virus ... returned with 4.0 innings of work, allowing one run, May 15 in Atlanta, departing the game due to a leg cramp ... Earned the win his final start of the season, May 20 at Cincinnati ... allowed one run in 6.0 innings, walking three and striking out seven ... would be placed on the disabled list six days later with right triceps tendinitis ... Made a rehab appearance with Single-A South Bend, June 25, and allowed one run in 5.0 innings ... experienced elbow discomfort during the outing and was shut down ... Had a second rehab appearance with South Bend, August 18, and departed after 1.0 inning ... an exam the following day showed a stress reaction to the tip of his right elbow, as well as a triceps strain, and he was shut down for the remainder of the season ... Underwent arthroscopic debridement surgery on his right elbow, September 12, performed by Dr. Keith Meister. Yu made 31 starts between the Rangers and Dodgers, his most games started since a career-high 32 games in 2013 ... went a combined 10-12 with a 3.86 ERA (80 ER/186.2 IP) and 209 strikeouts, his third season with at least 200 strikeouts... Limited righties to a .194 average, the seventh-lowest mark in the majors ... overall held opponents to a .228 average, the 13th-best mark in the majors... Acquired by the Dodgers at the July 31 trade deadline in a four-player trade with the Texas Rangers … went 4-3 in nine starts with Los Angeles, posting a 3.44 ERA (19 ER/49.2 IP) and struck out 61 batters against 13 walks … held hitters to a .235 average and posted a 1.15 WHIP... Went 2-0 with a 0.47 ERA (1 ER/19.1 IP) in his final three regular season starts, striking out 21 batters against just one walk... Notched his 1,000th-career strikeout, September 8 vs. Colorado ... became the fastest pitcher to reach the mark both in terms of games (128) and innings pitched (812.0 IP). © In 15 starts on the road, he went 6-4 with a 2.44 ERA (25 ER/92.1 IP) and struck out 105 batters against just 28 walks... In 22 starts with the Rangers, he went 6-9 with a 4.01 ERA (61 ER/137.0 IP) and limited the opposition to a .225 average, while punching out 148 batters against 45 walks... Selected to the A.L. All-Star team for the fourth time in his career, most by a pitcher in Rangers history ... was not eligible to pitch in the game since he started Texas' game on the Sunday prior to the All-Star break... Went 2-2 with a 6.14 ERA (10 ER/14.2 IP) in four postseason starts ... was 2-0 with a 1.59 ERA (2 ER/11.1 IP) in his first two postseason outings, including collecting the win in NLCS Game Three at Wrigley Field (6.1 IP, 6 H, 1 ER) ... however, he allowed eight earned runs in 3.1 IP in two World Series starts. Despite making just 22 starts and missing the last 7 weeks of the season due to right elbow inflammation, Darvish was selected Rangers Pitcher of the Year for a 2nd straight season...led the team in strikeouts (182, 10th in A.L.) and quality starts (14), and tied for club lead in wins (10) in his 3rd MLB season...also ranked among team leaders in complete games (T1st, 2), innings (2nd, 144.1), and starts (T3rd)...opponents batted career-high .241 (133-551), but hit just .180 (24-133) with RISP, 2nd-lowest in A.L. and 3rd in MLB (CIN's Johnny Cueto-.161, BAL's Bud Norris-.173) among pitchers with 145+ BF. Was the Rangers Pitcher of the Year…led the majors with 277 strikeouts, the highest total in the American League since 2000, and 11.89 strikeouts per 9.0 innings…allowed the A.L. 's lowest opponents batting average (.194) and fewest hits per 9.0 innings (6.22), ranked 3rd among league qualifiers in fewest baserunners per 9.0 innings (10.00) and was 4th in earned run average (2.83), 6th lowest in team history, and WHIP (1.07)…also led the Rangers in wins (13) and finished 2nd in innings (204.0) and starts (31)...Opened the season by going 7-1, 2.97 (20 ER/60.2 IP) in his first 9 starts through May 16…was the Rangers April Player of the Month at 5-1, 2.33 over 6 starts while tying the club record for wins in that month…went 5-0, 3.07 (14 ER/41.0 IP) over 6 games from April 19-May 16, the longest winning streak of his career. Posted a 1-3 record and 3.07 ERA (20 ER/58.2 IP) over his next 9 starts from May 21-July 6 with lone victory in that span coming on June 30 vs. CIN…was on DL for next 15 days (see next page) but returned to go 4-1, 1.31 (5 ER/34.1 IP) over 5 outings from July 22-Aug. 12…went 0-4, 3.38 (15 ER/40.0 IP) over his next 6 starts, his longest ML losing streak, before winning on Sept. 19 at TB…was 1-0, 3.38 (6 ER/16.0 IP) over last 3 starts, pitching less than 6.0 innings in all 3 games…overall, was 5-5, 2.59 in 14 starts after the All-Star break... Pitched at least 6.0 no-hit innings 3 times, matching the Mets' Matt Harvey for the most in the majors…retired the first 26 batters in season debut on April 2 at HOU before Marwin Gonzalez's single…fanned 14 in his 8.2 innings before Michael Kirkman recorded final out…was the first Ranger to ever lose a no-hitter as late as 8.2 innings, first in the majors to do so since Detroit's Armando Galarraga on June 2, 2010 vs. CLE…San Francisco's Yusmeiro Petit (Sept. 6 vs. ARI) and St. Louis' Michael Wacha (Sept. 24 vs. WSH) also lost no hitters with 2 outs in the 9th in 2013...Tossed 5.2 perfect innings and 7.1 no-hit innings with 15 strikeouts on Aug. 12 at HOU, settling for a combined one-hitter w/ Joe Nathan (1.0 IP)…only hit was solo HR to Carlos Corporan w/ one out in 8th…is only ML pitcher since 1900 to win 2 games in a career (April 2 at HOU & Aug. 12 at HOU) w/ 14+ K's, one-or-zero hits, and one-or-zero BB…is also first pitcher in expansion era (since 1961) with multiple no-hit bids of 7+ IP against same team in a season…the only other pitcher since 1900 to have a 15-strikeout game with a home run as only hit allowed was Boston's Pedro Martinez on 9/10/99 at NYY…the last Texas pitcher to have 2 no-hitters broken up in 8th-or-later in same season was Ryan in 1989 with 5 (Elias Sports Bureau). Went 16-9 with a 3.90 ERA (83 ER/191.1 IP) in 29 games/starts with Texas in his major league debut...led all ML first-year pitchers with 221 strikeouts and 191.1 innings while ranking T1st in wins...set club records for wins and strikeouts by a rookie...overall, had the A.L. 's 3rd-lowest opponents' batting average (.220), 2ndbest strikeouts per 9.0 innings ratio (10.4), and also ranked among the league leaders in strikeouts (5th), walks (4th, 89), wins (T6th), and winning percentage (7th, .640)...on the Rangers' staff, was first in strikeouts and opponents' batting average and 2nd in earned run average (3.90), wins, starts (29), and innings...joined Cleveland's Herb Score in 1955 as the only rookies in A.L. history with at least 16 wins and 210 strikeouts in a season, just the 5th such rookie in the modern era (since1900)...ALL-STAR: Was selected to the A.L. All-Star team by virtue of winning the final man voting with over 7.3 million votes...did not pitch in the July 10 game at KC...was the 9th Japanese player selected to the All-Star Game and 2nd starting pitcher, joining the Dodgers' Hideo Nomo, who was also selected as a rookie in 1995.WINS: Tied Arizona's Wade Miley for tops among ML rookies with 16 victories, matching the Yankees' Ivan Nova (16 in 2011) for the most by an A.L. rookie since Detroit's Justin Verlander had 17 in 2006...joined Miley as just the 7th and 8th rookies with 16+ wins since 1990...was the first season with more than one ML rookie with 16+ wins since 1984 (Dwight Gooden and Mark Langston-17 each)...previous club record for wins by a rookie was 12 on 3 occasions, last by Chris Young in 2005...was the 5th time a native of Japan (first rookie) has recorded as many as 16 victories in a season: 18 by Boston's Daisuke Matsuzaka in 2008, and 16 for Nomo in 1996, 2002, and 2003...earned 16 victories in his first 28 ML starts, best ever for a Ranger...was 10-2, 3.88 in 14 starts at Rangers Ballpark, tying for 3rd in the A.L. in home victories, the most by a Ranger since C.J. Wilson (11) in 2010...won all 3 starts against A.L.-champion Detroit, the first rookie with as many as 3 wins vs. the Tigers since Seattle's Freddy Garcia and Toronto's Roy Halladay were both 3-0 in 1999...won both starts against the National League...had 10 wins at All-Star break, 2 more than any other rookie in club history...STRIKEOUTS: Fanned 221 batters, matching the 5th-highest total in club history and most since 1990 (Nolan Ryan-232; Bobby Witt-221)...previous team rookie mark was 189 by Edwin Correa in 1986...tied the 7th-most for a ML rookie since 1900, the most since the Cubs' Kerry Wood (233) in 1998...are the 2nd-most ever for an A.L. rookie behind Herb Score (245) in 1955...recorded his 200th strikeout in his 27th game on Sept. 14 vs. SEA, tying the 4th-fewest outings since 1918 for a pitcher to reach 200 career K's: 23-Nomo and Wood; 25-Dwight Gooden; 27-Mark Prior...had his 100th career strikeout in 15th game on June 26 vs. DET, fewest contests ever for a Ranger...had 2 streaks of exactly 5 straight starts of 7+ strikeouts (April 24-May 16; Aug. 1-28), first pitcher in Rangers history with multiple 5-game streaks in one season...no Ranger had posted 7+ K's in 5 straight since 1990 (Ryan and Witt)...Recorded 10-or-more strikeouts 8 times, the most in the majors in 2012 and matching Nolan Ryan in 1990 for the 2nd-most in club history behind Ryan's 18 in 1989...also ranked 2nd in the majors...with 12 games of 9+ K's and 15 games of 8+ K's (tied with Mets' R.A. Dickey), trailing only Detroit's Max Scherzer in both categories...was 3rd ML pitcher since 1918 with at least 8 games of 10+ K's in first 24 career games (Nomo/Gooden-10 each)...fanned high of 11 batters 4 times: May 6 at CLE, June 15 at HOU, July 1 vs. OAK and July 21 at LAA...registered at least one strikeout in 14 consecutive innings pitched, June 20-July 1, the longest streak by a Ranger since Ugueth Urbina (14, June 18-July 9, 2003) and the longest by a ML rookie since Atlanta's Brandon Beachy (16, Sept. 7-24, 2011)...recorded 111 strikeouts in Arlington, 2nd-highest single-season figure ever by a pitcher at Rangers Ballpark (Aaron Sele-115 in 1999)...his 110 K's on the road were 5th-most in Rangers history...INNINGS AND RUNS: His 191.1 innings were the 3rd-most ever by a Ranger rookie behind Mike Smithson (223.1 in 1983) and Edwin Correa (202.1 in 1986)...worked 7.0-or-more innings 13 times with a high of 8.1 frames on April 24 vs. NYY...pitched 7.0+ innings in final 6 and 11 of last 16 outings...issued 2-or-fewer runs 11 times with shutout performances on April 24 vs. NYY (8.1 IP) and Aug. 28 vs. TB (7.0 IP). Went 18-6 with a 1.44 ERA (37 ER/232.0 IP) for Hokkaidoin his final season in Japan...the 1.44 ERA was the lowest of hiscareer, as he also posted career highs in wins (18), strikeouts(276), innings (232.0), starts (28), and shutouts (6)...matched career low with 5 HR allowed (also 2010)...led NPB in strikeouts, innings, opponents average (.190), shutouts (tied), home runs per9 innings (0.19), opponents OBP (.229), and opponents slugging(.241)...the opponents OBP and slugging figures were careerlows...ranked among circuit leaders in ERA (2nd), completegames (2nd), strikeout/walk ratio (3rd, 7.67), and wins (T3rd)...tossed at least 7.0 innings in every outing last season, with hislone outing of more than 3 runs coming in his first start...his career-low run support average of 3.10 runs per 9 innings ranked23rd out of NPB's 33 qualifying pitchers...received one or zeroruns of support in 4 of his 6 defeats. Went 12-8 with a 1.78 ERA (40 ER/202.0 IP) in 26games/25 starts...his 5 HR allowed matched a career low (also2011)...the 8 losses were a career high, as he received 2-runs-orless of support in 7 of those 8 defeats...opponents batted .216(158-733)...led all NPB pitchers in ERA for a 2nd straight year, andalso had most strikeouts (222) and complete games (10)...had circuit's lowest average of HR per 9 innings (0.22) and opponents slugging pct. (.273)...ranked among NPB leaders in opponents average (2nd), strikeouts per 9 innings (2nd, 9.89), opponents OBP(3rd, .268), SO/BB ratio (3rd, 4.72), and quality starts (T3rd, 21)...posted 12 consecutive quality starts from April 24-July 17, went 6-4 with a 1.14 ERA (12 ER/95.0 IP)...Hokkaido finished 4th in thePL and did not make the postseason. Was named Pacific League MVP, his 2nd such honor (also 2007), becoming just the10th pitcher in the history of Japanese professional baseball to winmultiple MVP awards...was also named to PL Best Nine...went 15-5, 1.73 (35 ER/182.0 IP) in 23 games/starts, with the ERA being2nd-lowest figure of his career...opponents batted .186 (118-635),best in NPB...also had circuit's lowest opponents OBP (.246) andslugging (.263) figures...his 0.45 home runs per 9 innings was bestamong qualifiers...also ranked among NPB leaders in ERA (2nd),wins (T4th), strikeouts (5th, 167), and quality starts (T6th, 20)...allowed more than 3 runs just twice: July 8 at Saitama (4) and Aug.21 at Fukuoka (6)...in the latter contest, he matched a career highby allowing 2 home runs, also the last time he permitted multiplehome runs in a NPB contest...named PL Monthly MVP in May aftergoing 4-0, 0.90 (4 ER/40.0 IP) in 5 starts...allowed career-high 19steals...his only postseason outing was a win in Japan SeriesGame 2 on Nov. 1 vs. Yomiuri at Sapporo Dome (6.0 IP, 7 H, 2 RER), but his club would lose the series 4-games-to-2...Hokkaidowon the Pacific League, giving them a first-round bye, and Darvishdid not pitch in the "season stage" against Tohoku...WBC: Went2-1, 2.08 (3 ER/13.0 IP) in 5 games/2 starts for Japan in the WorldBaseball Classic...opponents batted .156 (7-45) with no extra-basehits, 6 walks, and 20 strikeouts...started the Pool A opener onMarch 5 vs. China at Tokyo Dome, a 4-0 win (4.0 IP, 0 H, 1 BB, 3SO)...pitched scoreless relief inning (no decision) of 1-0 loss onMarch 9 vs. South Korea, but his club still advanced...took loss instart on March 17 vs. South Korea (5.0 IP, 4 H, 3 R-2 ER), a 4-1defeat at PETCO Park, his only Round 2 appearance...was on themound to finish Japan wins in both the semifinals and finals onMarch 22-23 at Dodger Stadium...retired Derek Jeter (groundout),David Wright (K swinging), and Adam Dunn (K looking) in the 9thinning to complete a 9-4 win over the U.S. in the semis...in finals,once again vs. South Korea, gave up game-tying single in the 9th,but tossed a scoreless bottom of the 10th to earn the 5-3 win afterIchiro Suzuki's 2-run single in the top half of the frame. Went 16-4, 1.88 (42 ER/200.2 IP) in 25 games/24 starts, the 2ndhighest win total of his career...was named the PL Monthly MVP 3times: March (1-0, 18.0 scoreless innings), April (4-0, 1.54), andSeptember (5-0, 1.29)...won a Pacific League Golden Glove Awardfor a second straight year...opposition hit .195 (136-696) with a.252 OBP, both lowest in NPB...ranked among leaders in ERA(2nd), strikeouts (2nd, 208), opponents SLG (2nd, .283), wins (3rd),SO/BB ratio (4th, 4.73), quality starts (T4th w/ Colby Lewis, 21),and HR per 9 (6th, 0.49)...allowed more than 3 runs just 3 timesall year...his ERA climbed above 2.00 just twice all season...won5 straight starts both June 17-July 17 and Sept. 2-29...won bothpostseason starts, both complete game efforts in which he did notpermit an earned run (18.0 IP)...won in first round Game 1 at Orix,a 4-1 victory as Hokkaido won that series 2-games-to-none...alsowon second round Game 2 at Saitama 5-0, but his club would losethe series 3-games-to-2...took a leave to represent Japan at the2008 Beijing Olympics, going 0-1 with a 5.14 ERA (4 ER/7.0 IP)and 10 strikeouts in 3 games/one start...pitched in relief twiceagainst a U.S. squad that included former Ranger Taylor Teagarden, including in the bronze medal game that Japan lost. Won his lone career Eiji Sawamura Award, which honors the topstarting pitcher in NPB, and was named Pacific League MVP...named to PL's Best Nine, won a Golden Glove Award, and wasnamed an All-Star, all of which were career firsts...went 15-5, 1.82(42 ER/207.2 IP) in 26 games/starts in what was his first career200-strikeout season...opponents batted career-low .174 (123-706)as he posted career-best 12 complete games, both the top figuresin NPB...also led all pitchers with 210 K's, .241 opponents OBP,and .246 SLG against...his 26 starts and 207.2 innings rank as2nd-most of his career...ranked among NPB leaders in HR/9 (2nd,0.39), innings (3rd), wins (T4th), and quality starts (T5th, 20)...beginning July 6, went 9-1, 1.16 (12 ER/93.0 IP) over his final 12starts...was named PL Monthly MVP in August (5-0, 1.35)...Hokkaido repeated as PL champions in manager Trey Hillman'sfinal season, and received a bye...club then beat Bobby Valentine'sChiba Lotte Marines in the second round, 3-games-to-2, withDarvish winning starts in Games 1 (CG, 9.0 IP, 2 R-ER) and 5 (6.2IP, 1 R-ER)...he earned the club's lone win in a Japan Series rematch vs. Chunichi, going the distance in Game 1 at SapporoDome in a 3-1 victory (9.0 IP, 4 H, 1 R-ER, 3 BB, 13 SO)...he tookthe 1-0 loss in decisive Game 5 (7.0 IP), a contest in which NipponHam was blanked on a combined perfect game...would pitch for aJapan team that won Gold Medal at the Asian Baseball Championship in Taiwan in December. Went 12-5 with a 2.89 ERA(48 ER/149.2 IP) in 25 games/24 starts in his first full season withHokkaido, as club won its first Japan Series title since 1961...heposted the 6th-best ERA in the PL, 2nd on his club behind TomoyaYagi (2.48)...his 12 wins tied Yagi for the team lead and rankedT5th in the PL...opponents hit .237...he was 5-1, 1.03 (7 ER/61.1IP) in 9 games/8 starts at Sapporo Dome...allowed a career-high12 HR for the season...lost 5 of his first 7 decisions...beginningMay 18, went 11-1, 2.34 (28 ER/107.2 IP) over his final 18games/17 starts...made 3 starts in the postseason, going 2-1, 2.01(5 ER/22.1 IP)...started club's first postseason game, which camein second round due to bye for the PL champions...earned 3-1 winvs. Fukuoka at Sapporo Dome on Oct. 11 (CG, 9.0 IP, 7 H, 1 RER) and Hokkaido would win both games to take the series...tookloss in Game 1 of Japan Series at Chunichi, giving up a 2-0 lead inthat contest (6.0 IP, 5 H, 3 R-ER) in a 4-2 defeat...was brought back5 days later for Game 5 at Sapporo Dome, earning the 4-1 win toclinch the title for Hokkaido...with his victory in that series' Game5, he became just the 5th pitcher in NPB history to win a Japan Series game prior to turning 21 years old...was the Asian Series MVPin Hokkaido's win over Taiwan's La New Bears following the JapanSeries. Made his NPB debut at the age of 18 on June 15vs. Hiroshima at Sapporo Dome (W, 8.0 IP, 9 H, 2 R-ER)...gaveup back-to-back solo HR in the 9th, but became the 12th pitcher inNPB history to earn a win in a pro debut as a rookie straight out ofhigh school...pitched his first complete game in a 3-0 loss on Aug.6 vs. Seibu at Sapporo...posted first career shutout in penultimateregular season start at Sapporo on Sept. 18 vs. Tohoku (9.0 IP, 2H), becoming only the 14th pitcher in NPB history to throw a complete game shutout as a rookie out of high school. November 2, 2018 Chicago Cubs activated RHP Yu Darvish from the 60-day injured list. August 19, 2018 Chicago Cubs sent RHP Yu Darvish on a rehab assignment to South Bend Cubs. August 10, 2018 Chicago Cubs transferred RHP Yu Darvish from the 10-day disabled list to the 60-day disabled list. Right triceps tendonitis. June 25, 2018 Chicago Cubs sent RHP Yu Darvish on a rehab assignment to South Bend Cubs. May 26, 2018 Chicago Cubs placed RHP Yu Darvish on the 10-day disabled list retroactive to May 23, 2018. Right triceps tendinitis. May 15, 2018 Chicago Cubs activated RHP Yu Darvish from the 10-day disabled list. February 13, 2018 Chicago Cubs signed free agent RHP Yu Darvish. November 2, 2017 RHP Yu Darvish elected free agency. August 27, 2017 Los Angeles Dodgers activated RHP Yu Darvish from the 10-day disabled list. August 19, 2017 Los Angeles Dodgers placed RHP Yu Darvish on the 10-day disabled list retroactive to August 17, 2017. Lower back tightness. August 2, 2017 Los Angeles Dodgers activated RHP Yu Darvish. July 31, 2017 Texas Rangers traded RHP Yu Darvish to Los Angeles Dodgers for 2B Willie Calhoun, RHP A.J. Alexy and SS Brendon Davis. July 16, 2016 Texas Rangers activated RHP Yu Darvish from the 15-day disabled list. July 4, 2016 Texas Rangers sent RHP Yu Darvish on a rehab assignment to Frisco RoughRiders. June 13, 2016 Texas Rangers placed RHP Yu Darvish on the 15-day disabled list retroactive to June 9, 2016. Right shoulder discomfort. May 28, 2016 Texas Rangers activated RHP Yu Darvish from the 15-day disabled list. May 16, 2016 Texas Rangers sent RHP Yu Darvish on a rehab assignment to Frisco RoughRiders. May 6, 2016 Texas Rangers sent RHP Yu Darvish on a rehab assignment to Round Rock Express. May 1, 2016 Texas Rangers sent RHP Yu Darvish on a rehab assignment to Frisco RoughRiders. April 3, 2016 Texas Rangers placed RHP Yu Darvish on the 15-day disabled list retroactive to March 25, 2016. November 6, 2015 Texas Rangers activated RHP Yu Darvish from the 60-day disabled list. November 3, 2014 Texas Rangers activated RHP Yu Darvish from the 60-day disabled list. September 7, 2014 Texas Rangers transferred RHP Yu Darvish from the 15-day disabled list to the 60-day disabled list. August 13, 2014 Texas Rangers placed RHP Yu Darvish on the 15-day disabled list retroactive to August 10, 2014. Right elbow inflammation. April 6, 2014 Texas Rangers activated RHP Yu Darvish from the 15-day disabled list. July 22, 2013 Texas Rangers activated RHP Yu Darvish from the 15-day disabled list. July 11, 2013 Texas Rangers placed RHP Yu Darvish on the 15-day disabled list retroactive to July 7, 2013. Right shoulder strain. January 18, 2012 Texas Rangers signed free agent RHP Yu Darvish.